In what seems to be more of a market gimmick than a test, Domino's is delivering pizza via canoe along the River Loose in Kent County in the UK. 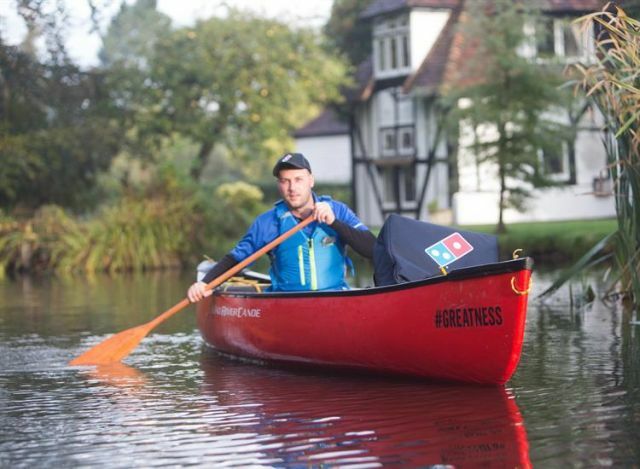 According to Kent Online, A pizza "buoy" in a full wetsuit sets out in a canoe to deliver to houses along the river. To make sure that the pizza doesn't get waterlogged if the canoe happens to capsize, it comes in a delivery bag that floats. Considering the company has also tested drone delivery in the UK as well as a few other countries, canoe delivery seems to cater to too small an audience to gain any real traction. Additionally, the delivery test is only running for two weeks.